When the body is no longer adapting to its environment in an appropriate manner, the result is pain and decreased physical or mental performance. This failure of the body to adapt and maintain homeostasis is often linked to an upper cervical vertebra fixed in a misaligned position under the skull, causing interference to the the nervous system - which is literally the link between the brain and body. To eliminate nervous system interference at the root level, a specific, three dimensional vectored adjustment must be performed on the atlas or axis vertebra to unlock them, restoring proper weight bearing of the spinal column and proper function to the brain-stem and spinal cord. With the pressure off the brain-stem area, the nervous system regains its ability to transmit electrical impulses to and from the brain and body without interruption. This is fact, NOT fiction. Researchers have video CSF studies showing CSF flow increasing from brain to spine after a precise, vectored atlas correction! The final result is that the body’s Innate healing ability is able to express itself more freely in all cells, and the body is able to overcome many detrimental conditions under its own power – without the aid of mind and body altering substances or invasive intervention. Reduced environmental impact- 4 Billion prescriptions are filled each year in the USA. That's a LOT of landfill material in the wrappers alone! I encourage prospective patients to read my article, Thoughts, Traumas, & Toxins, available here, to familiarize themselves with our philosophy. Allow at least half an hour of face time for the first visit, as we actually do want to spend time getting to know you and the challenges you are dealing with, so we may face them together! Every patient is welcomed to the office and the examination begins with discussion of their case history and current condition. Demonstration is then given of the different instruments and analysis employed to arrive at the recommend plan of action to overcome their current health challenges. The patient is then given a non-invasive, examination, including palpation, Range of Motion, and neurological/orthopedic testing as indicated by their condition. Computerized Tytron C-5000 infrared instrumentation is used for thermographic pattern analysis. Prill leg checks are used to determine levels and direction of misalignment. 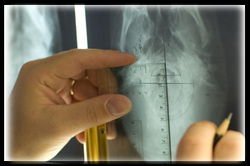 If tests indicate, a precision Upper Cervical x-ray series must be taken in weight bearing position for analysis. We have found the Prill checks to be highly accurate in determining listings on young patients from just months old into the 12-16 year old range. Due to calcification, traumas and structural changes, most patients past the teenage years will need to have the Upper Cervical region x-rayed to determine the exact misalignment vectors with the precision required for a complete vectored correction. All our films are taken with exacting standards on state of the art equipment at Grossman Imaging Centers in Ventura, with the lowest radiation levels possible. Not only will your films be read by the top medical radiologists in Ventura County, but you will also get the highest quality films at the lowest out of pocket cost. A note to patients referred by neurologists: A high quality C.T. Scan may often be utilized for analysis. If you have already undergone a C.T. Scan of the upper cervical spine, please bring a copy of the scan on CD. If a cervical MRI has already been performed, it contains useful information so please bring it as well, but unfortunately, MRI cannot replace the x-ray films. MRI is primarily utilized for soft tissue visualization, and rarely shows the boney alignment in enough detail to be utilized for analysis. During the second visit, the specific x-ray series is analyzed for misalignment vectors, and an additional nervous system examination & thermographic scan is performed to determine the body's inclination of adaptation or pattern. The vertebral adjustment given is a resultant line of reduction introduced by intention and direction inversely proportional to the individually measured vertebral misalignment. It is gently and effectively delivered by hand. When we say every patient gets a specific, tailor made correction, we mean it. No two patients are exactly the same, no two misalignments are exactly the same, and no specific correction can be exactly the same. Following an atlas correction, the patient then rests in a neutral spinal posture to help the body realign and hold the adjustment. After resting, the patient is post scanned to determine the body's response to the correction, then instructed with a list of “Dos and Don’ts”, and the next nervous system check is scheduled. On subsequent visits, adjustment may or may not be required, depending upon the patient's ability to hold the previous correction. When delivered appropriately, the adjustment should be the exception, not the rule. During the next visits, the doctor will pay special attention to determine if the patient is holding or slipping back into pattern. Dr. Smith has helped me very much. I feel his knowledge has made my injury much better. Thank you - Dave B. If you appreciate our approach to health, and would like to see if we may help your condition, please visit our contact page.